Mercedes-Benz (German pronunciation: [mɛʁˈtseːdəsˌbɛnts]) is a global automobile manufacturer and a division of the German company Daimler AG. The brand is known for luxury vehicles, buses, coaches, and trucks. The headquarters of Mercedes-Benz are in Stuttgart, Baden-Württemberg, Germany. The name first appeared in 1926 under Daimler-Benz, but traces its origins to Daimler-Motoren-Gesellschaft's 1901 Mercedes and to Karl Benz's 1886 Benz Patent-Motorwagen, which is widely regarded as the first gasoline-powered automobile. Mercedes-Benz's slogan is "The best or nothing." Mercedes-Benz is one of the most recognized automotive brands worldwide. Today, many numerical designations no longer reflect the engine's actual displacement but more of the relative performance and marketing position. 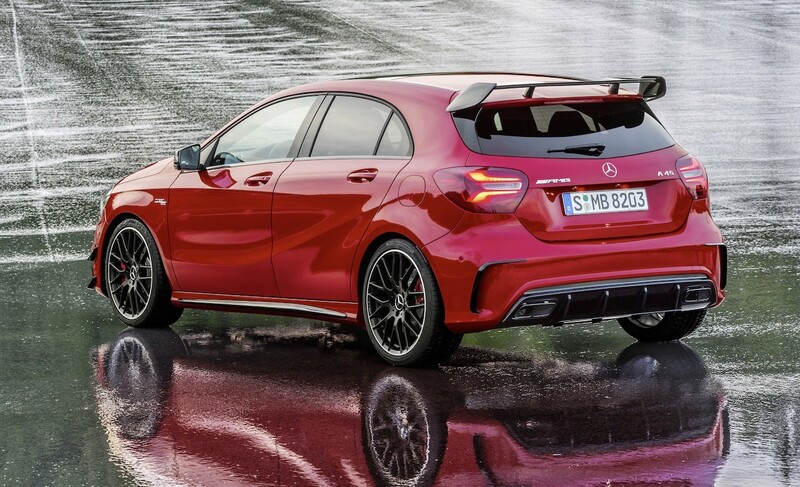 Despite its engine displacement in two litres, the powerplant in the A45 AMG produces 355 brake horsepower so the designation is higher as to indicate the greater performance. Another example is the E250 CGI having greater performance than the E200 CGI due to the different engine tuning even though both have 1.8-litre engines. From the marketing perspective, E200 seems more "upscale" than E180. Recent AMG models use the "63" designation (in honor of the 1960s 6.3-litre M100 engine) despite being equipped with either a 6.2-litre (M156) or 5.5-litre (M157) engine. Rationalisation of the model nomenclature was announced in November 2014 for future models. The changes consolidate many confusing nomenclature and their placements in the model range such as CL-Class is now called the S-Class Coupé. The naming structure is divided into four categories: core, off-road vehicle/SUV, 4-door coupé, and roadster. AMG GT, and V-Class are unaffected by the change. In October 2016, Mercedes unveiled the X-Class; a pickup truck built on the Nissan Navara. At the 2016 Paris Motor Show, the company announced the EQ-Class, a family of upcoming battery electric vehicles based on a modular platform, expected to represent up to 25% of its global sales by 2025. 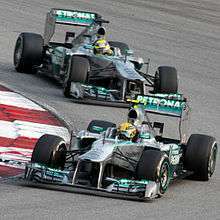 In 2014, Mercedes clinched its first F1 Constructor's title with drivers Lewis Hamilton and Nico Rosberg with 3 races to go, after dominating much of the season. Mercedes repeated its dominance in 2015 in similar fashion, losing only 3 races out of 19 once again. ↑ "Best Global Brands - 2014 Rankings". Interbrand. Archived from the original on 15 March 2015. Retrieved 26 March 2015. ↑ Auer, Georg. "A genius whose three-wheeler is seen as the first car". European Automotive Hall of Fame. 1 2 "Mercedes-Benz History". Edmunds.com. Archived from the original on 1 March 2009. Retrieved 26 September 2010. ↑ "DPMAregister - Marken - Registerauskunft". dpma.de. ↑ Klara, Robert (13 September 2015). "Hitler's car exerts grim fascination even if it just gave the Führer a lift to the airport". The Guardian. Retrieved 31 January 2016. ↑ Junk Jet n°2. igmade.edition. pp. 6–. GGKEY:W6X3P50T22D. ↑ "Daimler-Benz to Pay $12 Million for War Forced Labor". Los Angeles Times. 12 June 1988. ISSN 0458-3035. Retrieved 2 November 2016. 1 2 3 "Mercedes-Benz Safety Innovations". Theautochannel.com. 13 September 2010. Retrieved 26 September 2010. ↑ Daimler AG Investor Relations Archived 18 August 2011 at the Wayback Machine. ↑ "Behind the Scenes: Mercedez-Benz AMG". Motortrend.com. 26 February 2007. Retrieved 26 September 2010. ↑ "The history of Mercedes-AMG GmbH". 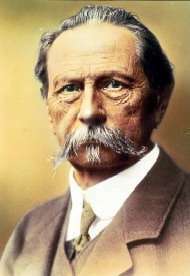 Media.daimler.com. 20 December 2000. Archived from the original on 25 February 2010. Retrieved 26 September 2010. ↑ "This Is Tesla's Big Chance In China. Will It Be Blown Again?". Forbes. 8 September 2016. Retrieved 8 September 2016. ↑ "Daimler to sell Mercedes-Benz branded all-electric battery cars in China". Reuters UK. 7 September 2016. Retrieved 8 September 2016. ↑ Buenos Aires, Mercedes-Benz Argentina S.A. | Daimler > Company > Daimler Worldwide > South America. 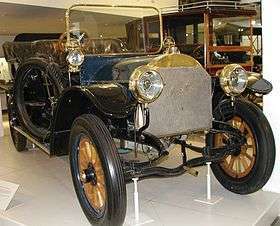 Daimler. Retrieved on 16 July 2013. Archived 8 July 2012 at the Wayback Machine. ↑ Martin, Norman (1999). "Going, Going, Graz". Automotive Industries. ↑ "Informações Corporativas: DaimlerChrysler no Brasil" [Corporate Information: DaimlerChrysler in Brazil] (in Portuguese). DaimlerChrysler. Archived from the original on 30 January 2009. ↑ "Mercedes Attacks BMW From Hungary With New Facility". Washington Post. Retrieved 29 March 2012. ↑ "Daimler plans 79 million Mercedes-Benz plant expansion". Bloomburg. Retrieved 27 June 2012. ↑ "Mercedes-Benz Indonesia – Passenger Cars homepage". Mercedes-benz.co.id. Retrieved 26 September 2010. ↑ "IKCO, Daimler sign agreement". MEHR news agency. 19 January 2016. ↑ "Anambra Motor Manufacturing Company Ltd". Anammco.com. Retrieved 26 September 2010. ↑ "South Africa's automotive industry". SouthAfrica.info. Archived from the original on 15 April 2010. Retrieved 26 September 2010. ↑ "Thonburi Group:Serving the Thai market for more than six decades". Archived from the original on 27 September 2009. Retrieved 15 October 2009. 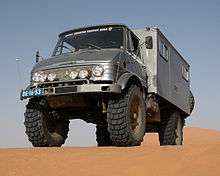 ↑ "Mercedes-Benz Türk - Otomobiller". mercedes-benz.com.tr. ↑ "MBUSI Products/Models". Mbusi.com. Archived from the original on 22 August 2010. Retrieved 26 September 2010. ↑ "Mercedes-Benz Vietnam Company Overview". mercedes-benz.com.vn. Daimler AG. 2010. Archived from the original on 23 November 2010. Established in 1995...Mercedes-Benz Vietnam....supplies both passenger cars and commercial vehicles to the market. ↑ "Business Week, November 2006". BusinessWeek. Retrieved 26 September 2010. ↑ "J. D. Power and Associates Reports: Ford Motor Company Captures Most Awards in 2007 Initial Quality Study". Jdpower.com. 6 June 2007. Archived from the original on 26 November 2009. Retrieved 26 September 2010. 1 2 "2008 Initial Quality Study | J. D. Power and Associates". Jdpower.com. 4 June 2008. Archived from the original on 25 November 2009. Retrieved 26 September 2010. ↑ "2011 U.S. Initial Quality Study (IQS)". JDpower.com. June 2011. Archived from the original on 31 July 2011. Retrieved 25 August 2011. ↑ "2011 U.S. Vehicle Dependability Study". JDpower.com. March 2011. Archived from the original on 10 August 2011. Retrieved 25 August 2011. ↑ "Mercedes-Benz Trucks – "Trucks you can trust" - Daimler > Brands & Products > Our Brands > Mercedes-Benz Trucks". 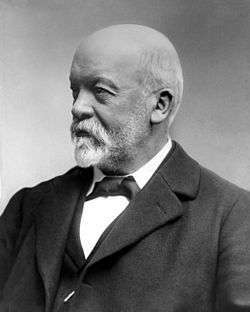 daimler.com. 4 December 2013. Archived from the original on 4 February 2011. ↑ "Mercedes-Benz builds new armoured Pullman State Limousine". gizmag.com. ↑ Ewing, Steven (11 November 2014). "Mercedes renames utility vehicles, repositions Maybach as sub-brand". Autoblog.com. Retrieved 12 November 2014. ↑ "Mercedes-Benz expands brand world and introduces new nomenclature: Mercedes-Maybach for the ultimate in exclusivity and individuality". Daimler AG. 11 November 2014. Retrieved 12 November 2014. ↑ "New Mercedes X-Class arrives and the 'premium pick-up' is born". Auto Express. Retrieved 27 October 2016. ↑ "Mercedes-Benz X-Class concept previews new pick-up". Retrieved 1 November 2016. ↑ Bubbers, Matt (8 November 2016). "For decades the future of electric vehicles has seemed a few years away". The Globe and Mail. Retrieved 28 November 2016. ↑ "2016 Mercedes-AMG A 45 gets boosted engine, 0-100km/h in 4.2sec". 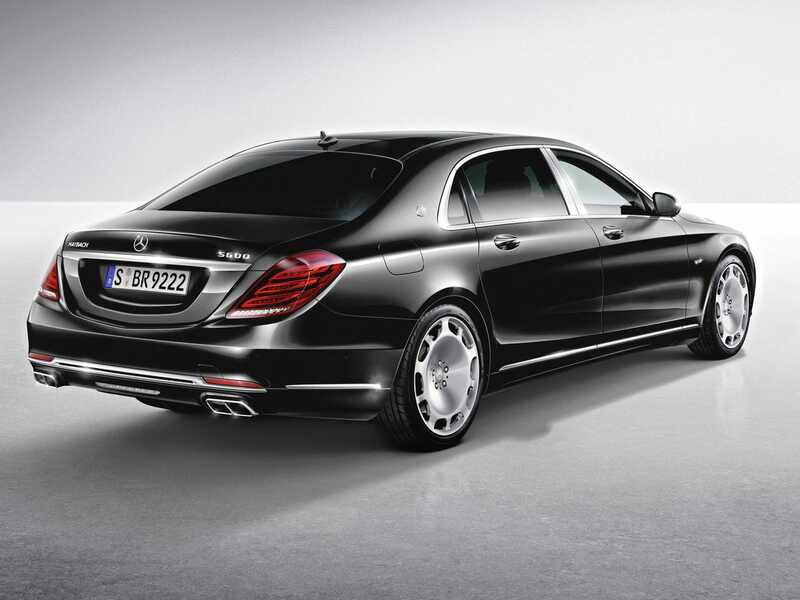 ↑ "Mercedes' Ultra Luxury Maybach Brand Is Making A Comeback". ↑ "Mercedes vehicles at the 2007 Frankfurt show". Emercedesbenz.com. 6 September 2007. Retrieved 26 September 2010. ↑ "A hybrid drives Mercedes concept". .lexisnexis.com. Retrieved 26 September 2010. ↑ "Mercedes-Benz Concept BlueZERO: Modular Drive Concept for Electric Vehicles | Daimler > Technology & Innovation > News". Daimler AG. 15 December 2008. Archived from the original on 15 March 2009. Retrieved 26 April 2009. ↑ "Mercedes-Benz SLS AMG E-Cell-Prototype Drive". Car and Driver. Retrieved 25 August 2011. ↑ "Mercedes enters the hybrid game – the S400 BlueHybrid". AutoUnleashed.com. Archived from the original on 15 April 2009. Retrieved 26 April 2009. 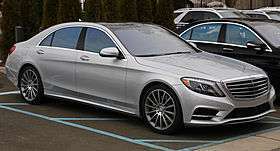 ↑ "2007 IAA Report – S-Class hybrid". Caranddriver.com. Retrieved 26 September 2010. ↑ Abuelsamid, Sam (30 July 2010). "Mercedes-Benz introduces new Vito E-Cell van – Autoblog Green". Green.autoblog.com. Retrieved 26 September 2010. ↑ Healey, James R. (23 March 2008). "Mercedes sees electric-car progress". USA Today. Retrieved 12 May 2010. ↑ "Elektromotive.com". Elektromotive.com. 3 June 2010. Archived from the original on 10 July 2011. Retrieved 26 September 2010. ↑ "Vehicles Subject to the Gas Guzzler Tax for Model Year 2009 (EPA420-B-08-016)" (PDF). Retrieved 26 September 2010. ↑ Gillies, Mark (March 2010). "2011 Mercedes-Benz S63 AMG - Auto Shows". Car and Driver. Retrieved 15 June 2011. ↑ "Mercedes-Benz presents the innovative Automatic Bike". Worldcarfans.com. Retrieved 26 September 2010. ↑ "The New Mercedes Benz Folding Bike". carpages.co.uk. ↑ "eMercedesBenz - The Unofficial Mercedes-Benz Weblog". emercedesbenz.com. ↑ "Mercedes-Benz 2009 Trekking Bike: Photo Gallery and Test". Veni, Vidi Velo !. Retrieved 6 June 2014. ↑ Mercedes-Benz Bike brochure 2009 Archived 8 January 2011 at the Wayback Machine. ↑ "Mercedes-Benz 2009 Bike Collection: The trailblazer". Mercedes-Benz Bike. Retrieved 15 June 2011. ↑ Hudson, Paul (23 December 2008). "Telegraph 23 December 2008". The Daily Telegraph. UK. Retrieved 12 March 2011. ↑ "Enciclopedia Britannica". Britannica.com. Retrieved 26 September 2010. ↑ "FIA: $100M fine handed to Mercedes". FIA. Archived from the original on 8 April 2009. Retrieved 26 April 2009. ↑ Benson, Andrew (3 July 2016). "Formula 1 2016: All you need to know about the teams". BBC Sport. Retrieved 8 November 2016. ↑ Davis, Jim (22 June 2012). "The True Story Behind the Mercedes-Benz Three-Pointed Star". emercedesbenz.com. Archived from the original on 16 February 2016. ↑ "Daimler press release 8 June 2009". Media.daimler.com. 8 June 2009. Retrieved 12 March 2011. ↑ "Mercedes-Benz Classic website". Mercedes-benz-classic.com. Retrieved 12 March 2011. ↑ "Porsche website". Porsche.com. Retrieved 12 March 2011. ↑ "Automotive Hall of Fame". Automotive Hall of Fame. Retrieved 12 March 2011. ↑ "A Nazi War Criminal's Life in Argentina". Spiegel Online International. Retrieved 1 April 2011. ↑ "A Nazi Criminal life in Argentina". Spiegel.de. 1 2 "Magazine". Roadsafe.com. Archived from the original on 1 December 2008. Retrieved 26 September 2010. ↑ "New Mercedes Diesel Engine Breaks World Endurance Record". Edmunds.com. Archived from the original on 23 September 2009. Retrieved 29 September 2010. ↑ "Performance: AMG 2.0-Liter Turbo Engine". ↑ Schmidhuber, Jürgen (2009). "Prof. Schmidhuber's highlights of robot car history". Retrieved 15 July 2011. ↑ "Mercedes' Vision Tokyo Concept: A Self-Driving Rave Van". www.yahoo.com/autos. Retrieved 27 October 2015. ↑ "Mercedes-Benz Ireland – New cars – AMG". Mercedes-benz.ie. Archived from the original on 29 July 2010. Retrieved 26 September 2010. ↑ "History of AMG". Pistonheads.com. 18 October 2002. Retrieved 26 September 2010. ↑ "Mercedes-Benz buys naming rights for Superdome, home of New Orleans Saints - ESPN". Espn.go.com. 4 October 2011. Retrieved 1 September 2012. ↑ Tucker, Tim. "Falcons officially announce Mercedes-Benz as naming rights partner". Atlanta Journal Constitution. Retrieved 24 August 2015.